Even for a beta, the merger of Google's two operating systems is a disappointment that begs the question: Why bother? Peanut butter and chocolate it's not. Android apps running on Chrome OS comprise an unpleasant mess, a highly uneven and limited experience that is below the quality level you'd expect even in beta mode -- a designation Google likes to apply to de facto shipping products to avoid commitment to users. Some important Android apps won't run in Chrome OS, many apps that do run work only in smartphone-size windows, and still others don't work reliably. Given that an Android tablet can do the job already, when it comes to Android on Chrome OS, you're left asking, "Why bother?" First, only a small number of Chromebooks can run Android apps today, though Google announced the capability last spring. Google maintains a list of Android-compatible Chromebooks, from manufacturers ranging from Acer to Viglen. I tested Android apps on Acer's $249 Chromebook R11 (aka series CB5-312T), a touchscreen convertible laptop (the screen folds over to be used as a tablet). Although the touchscreen is decent, the keyboard's touchpad responds poorly (it's really hard to move the pointer or click, and forget about right-clicking), the keyboard has an uneven feeling, and the device is sluggish both when working with apps and files and when accessing data over Wi-Fi. And the case material feels like the lid of a picnic cooler. One appeal of Chromebooks is that they are cheaper than both laptops and tablets, but you get what you pay for -- be clear about that because it casts the overall Chrome OS experience in an unlikable light. Still, the focus of this article is not the device, but the merger of Android apps and Chrome OS, an experience that the device quality may affect but not ultimately determine. Your Chromebook must also run Chrome OS 53 or higher; I used the current stable version, 54. If your Chromebook supports Android apps, you then enable the Google Play Store to get those Android apps. When you open the Google Play store app to get your existing Android apps and perhaps download new ones to the Chromebook, you'll notice some of your apps aren't in the list. That's because some Android apps don't work in Chrome OS. Of course, there are Android apps designed for a specific manufacturer's devices that don't work on other Android devices, but that's rarely the case for major third-party apps. By "major third-party apps," I mean Microsoft's Word, PowerPoint, Excel, and OneNote. On the Acer R11 I used for testing, the Google Play Store listed these apps as not compatible. These are the standard business productivity tools, so their omission matters greatly for business Chromebook use. 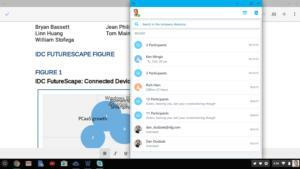 Interestingly, Microsoft's collaboration apps -- Outlook, OneDrive, Skype for Business, Outlook Groups, and Yammer -- were available for use on the same Chromebook. 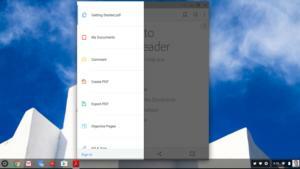 Some key Android apps -- such as the Office productivity suite -- don't yet run in Chrome OS. 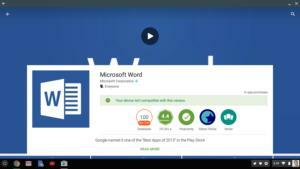 Microsoft has said it plans to make all its Office 365 Android apps run on Android-capable Chromebooks. But because the Play Store app for Chrome OS is still in beta (which you discover only after you install it), Microsoft doesn't currently guarantee compatibility. If your primary Chromebook usage is for work, the current Office omission on at least some devices could delay that plan. 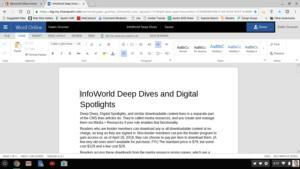 You can't run the Microsoft Word Android app in Chrome OS, but you can still use Word Online via the browser. The current lack of Office 365 productivity apps on at least some Android-capable Chromebooks also affects other Microsoft Office 365 apps, which expect direct access to files and other data stored on your Office 365 and/or Exchange accounts. OneDrive, for example, can show you your Office files and even let you view them in read-only mode, but you can't open them in Office Online from OneDrive. You can only open them in other Android apps, such as Polaris Office and Google's own G-Suite (Docs, Sheets, and Slides). Polaris Office is adequate, though using it means converting files between it and your productivity apps on other devices. And G-Suite continues to be a horribly limited productivity suite wholly unsuited to business use. The web version of G-Suite is much, more more capable than the native Android (or iOS) version, though still subpar compared to Office Online. The bottom line: For productivity usage on an Android-capable Chromebook, you may need to stick with web apps for the near future and avoid the Android apps. That removes significant potential value of Android apps on Chrome OS for many users. The good news is that many secondary Android business apps do work on Chrome OS, including Slack, Atlassian HipChat and Jira, Google Gmail, Box, Dropbox, Google Drive, Adobe Acrobat Reader, Concur, TripIt, Cisco AnyConnect, Salesforce1, and Microsoft's set of collaboration apps. Of course, Android falls down quickly when you get into more specialized apps, when compared to iOS, MacOS, and Windows. Also be clear that the Android apps you install may not work correctly. Acrobat Pro, for example, didn't hide its menu when I clicked in the app window or otherwise tried to dismiss it. AnyConnect made a VPN connection, but at least for my company network, internal services were still refused connection within the VPN. And Outlook Groups wasn't consistently able to navigate among available groups. These apps all worked properly on various Android smartphones and tablets that I tested. Again, the Play Store for Chrome OS is in beta, and these glitches may be a result of that unfinished state. I suggest any serious adoption wait until we know for sure how the final version of Play Store and Android apps work. Some Android apps in Chrome OS have glitches. For example, Adobe Acrobat Reader can't close its menu panel once it's been open. Is that a phone in your Chromebook? When you install Android apps on a Chromebook, you'll note that many apps are the smartphone version, not the tablet version that would work full-screen in Chrome OS. And it's not only apps that are limited to a smartphone version; Acrobat Reader, for example, has a tablet version for Android, but it's the smartphone version that's available for Chrome OS. 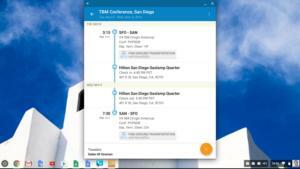 Some Android apps for Chrome OS work only in smartphone portraot mode, such as TripIt. What that means is people expecting to use Android on a Chromebook for a laptoplike or tablet-type experience won't often get it. That constrains again the value of Android apps on Chrome OS. Still, the situation is not as limited as running an iPhone app on an iPad, where you can't even rotate the iPad when using the iPhone app. In some Android apps, there's a menu option in the smartphone app's window to toggle between landscape and portrait views, and that helps make the smartphone app more usable on the Chromebook's screen. Left: A full-screen Android app (Google Docs) running in Chrome OS. Right: A smartphone Android app (Skype for Business); note the V-shaped icon at upper right that lets some smartphone apps switch between landscape and portrait windows. Furthermore, if you fold back the keyboard of a hybrid Chromebook to convert into a tablet (which the Acer R11 I tested can do), those smartphone apps that let you toggle between portrait and landscape mode do present in full-screen view. That's great, except where you'd really want the full-screen mode is when using the keyboard and trackpad, so you get the most PC-like experience when doing work on your Chromebook. The varying levels of responsive design among Android apps is a function of the fragmented, inconsistent Android ecosystem. But they seemed to come to the fore more often on the Chromebook than on the various Android tablets I use. It may be due to the fact that Chromebooks run Intel processors, and Intel's Android port to its x86 chips has always lagged the native ARM version that Google produces, and Intel's version has often had glitches. Or it could be due simply to the beta nature of Android support on Chrome OS. It's hard to know when for Google "beta" means "we want you to test it" versus "we know it's half-baked, but we're shipping it anyhow." There seem to be elements of both meanings in the current deployment of Android compatibility in Chrome OS. Either way, there aren't too many glitches in the Android-Chrome OS integration. 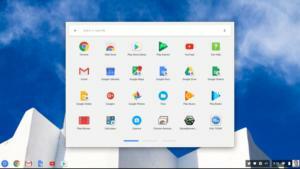 The initial apps screen in Chrome OS for accessing Android apps shows recent apps, as well as (at bottom) some Google Now widgets. There's a permanent button on the far left of the Chrome OS shelf (what a Windows user would call the task bar or a MacOS user the Dock) to open the app window, which shows the recently used apps and the All Apps button to show all installed apps -- based on the familiar Android home-screen design. I would have preferred to scroll from the Recent Apps window to the All Apps windows -- that would be easier and more touch-friendly -- but I'm guessing Google's engineers wanted to more closely mimic the Android home screen's use of the All Apps button. But be careful not to scroll down to the Google Now widgets below the initial app screen because you can't scroll back to your apps list. You have to, unintuitively, click or tap the left-arrow button that appears at the top left of the window. I get that it's meant to simulate Android's Back button, but if you can scroll down through a window, you should be able to simply scroll back up. You can rearrange apps within the All Apps window by dragging them, as you can on Android's home screen. The All Apps window in Chrome OS for accessing Android apps. When apps are running they appear on the shelf, and you can Alt-click an icon to open a contextual menu that lets you pin the icon to the shelf, similar to how Windows and MacOS work. A nice touch in the shelf's icons is that web apps like Gmail and Docs have a small circle superimposed on them to distinguish them from the Android apps, which have no such icon. I also found that the Restore button in app windows didn't always work to restore a window to its normal size. I'm pretty sure that wasn't because of the poorly responsive trackpad, given how many times I clicked the Restore button and had nothing happen. But I didn't see a pattern for when the Restore button became balky. Whether Google refines the current Android-on-Chrome OS experience and broadens its reach to more devices, there remains the question: Why bother? If your goal is to run apps on a laptop-type device, you have much better options available: laptops, tabtops, and tablets running a choice of Windows, MacOS/iOS, and Android. They're more capable, have greater support for native apps while fully supporting web apps, and are much better hardware. The original premise for the Chromebook was cheap, easy web access. That meant using only web apps, which Google to this day favors over its native apps such as in G-Suite. Why bring in native apps to that web experience? All it does is raise the cost, undermining one of Chromebooks' chief selling points. I get that Android-capable Chromebooks are still cheaper than the other devices. A laptop will cost you $600 to $3,000, a tabtop $500 to $2,000, and a decent tablet $400 to $1,200. An Android-compatible Chromebook can be had for $300 or less. But Chromebooks aren't that much cheaper than the base models of other devices, and most Chromebooks are cheaply built and harder to use -- that has to matter more than pure dollars, at least to a business. Beyond the low cost, the other original attraction of Chromebooks is that they were web-only, so IT didn't have to worry about data leakage or device security. Everything was in the cloud, so a lost device simply needed to be deactivated, a stolen device had no data that might be sensitive, and a device could easily be moved from one worker to another in shift work, whether students in a class or retail associates at a store. But Chromebooks that support Android apps have local storage, and they deal with apps that may or may not be managed -- exactly like smartphones, tablets, and computers. Yet they lack key security capabilities like encryption available in other computing devices. And they start getting complex enough to need on-site user support. Once a Chromebook is converted into a keyboard-equipped tablet, why not get a tablet, tabtop, or laptop to begin with? That's the existential "why bother?" question that Android-capable Chrome OS raises. 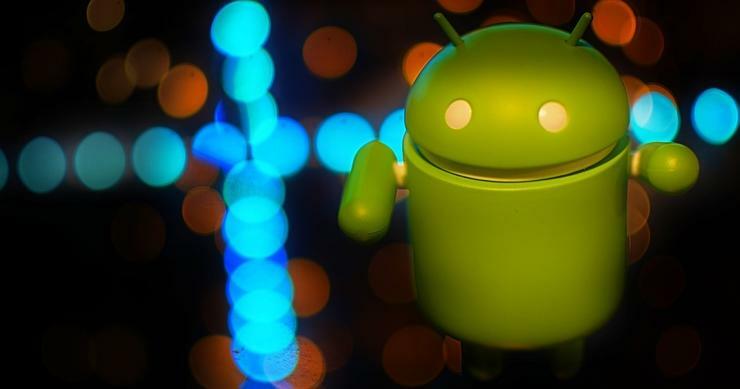 Perhaps it makes sense for Google to rework Android into the rumored Andromeda operating system, which purportedly will draw some aspects of Chrome OS into it. Even if true, that's about next-gen Android, not the original Chrome OS promise. Maybe Google's original web-only vision isn't tenable, and Google is now realizing that and planning a new course with the Andromeda project. Fine, but again the question remains: Why not focus on improving Android for tablets, tabtops, or laptops instead of fooling around with Android on Chrome OS? We are talking about Google here, a company that fools around with a lot of things and sometimes lets staff stick with them in denial mode even after its executives have moved on to other fascinations. That may be what's happening with Chrome OS. Whatever the situation at Google, it doesn't change the fact that Android on Chrome OS is an inferior combination to a pure Android device, and even more so to iOS, MacOS, and Windows devices. Maybe Android on Chrome can provide cheap computing training wheels for your kids, but otherwise, I don't get it.